Now, THAT was the most exciting two minutes in sports! She obviously wasn’t talking about the Derby; she was talking about the final minutes of Game 2, Rangers/Caps. I, unfortunately, couldn’t really relate to what she was saying, as I had sat in front of the TV covering my eyes, terrified of a Caps goal. I didn’t really see those two minutes. That thrill, that anxiety, was nowhere in evidence on Monday night at the Garden; injury was added to the insult of the Rangers’ terrible play by the pre-game distribution of internally lit thunder sticks. Surely, we at the Garden are above such cheap, fan-rousing gimmicks? Surely, we don’t need such artificial means to get us going? The rally towel was bad; this was worse. But not even internally lit thunder sticks could do much on a night when the Rangers sat back, curled up, gave in, and lost 4-0. With no small amount of trepidation, I ventured back to the Garden on Wednesday night. 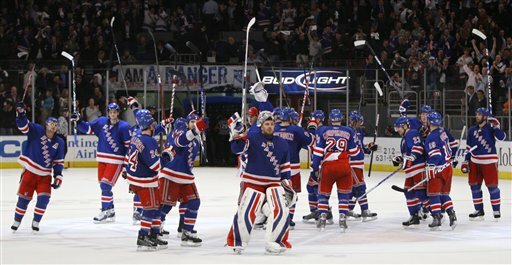 The Rangers didn’t deserve to win. They survived because of their goaltender, and if they continue to rely on him, he’ll be a burnt-out shell before the second round. IF we get that far. They took bad penalties. They played passively in their own end. They got embarrassingly outshot. They were offsides far too often, and at key moments. But there’s nothing like being at the Garden on a night when the Rangers are winning, and playing with intensity. The race track isn’t like this, because there, we all root against each other. At the Garden, we all want the same thing, and when Avery took that penalty at nearly 17:00 of the third, with the possibility of a pulled goltender, and a six against four…18,200 rose as one, cheered their guts out, and willed their team to win. Sorry, Jenny…THAT was the most exciting two minutes—OK, three–in sports. On the way out of the Garden, I ran into fellow Rangers fan and blogger, and recent Fan of the Game Alan Mann of Left at the Gate…we lifted a celebratory bourbon before heading to our respective trains…wondering whether we’ll be back at the Garden on Sunday afternoon for Game 6. So the Rangers’ playoff lives are now eight days old, with game five on Friday. Want to enjoy this Rangers’ fun and contribute to a good cause? Check out Ian Lozada’s playoff beard, and make a pledge…the longer the Rangers are in it, the longer Lozada’s beard, and the more money that goes to the Belmont Child Care Association! Looks like the our Bruins will be playing your Rangers (not to jinx anything for you).Lexignton and Keeneland were great. We made it to Old Friends and Darley, and the track kitchen was a great suggestion. We ate there every morning. Toronto is very quiet this playoff season and I’m thankful…in previous years, crazed Leaf fans would run to the streets to celebrate winning game 2 in the opening round as if it was a Game 7 Stanley Cup victory. Pathetic!Who’s going to win our Road To The Roses pool? SHHHHH! No jinxing! No talking about next rounds!Glad you had a great trip–oh, those grits! Those apples!TDH: must admit, I miss the Leafs in the playoffs. After the Rangers, I root for Canadian teams, followed by Original Six.RttR standings to be posted tomorrow…it ain’t going to be me!